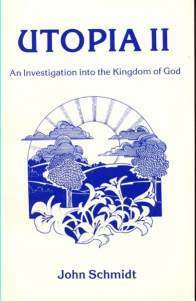 UTOPIA II: AN INVESTIGATION INTO THE KINGDOM OF GOD by John Schmidt. Why Utopia?, Mankind's Past, Present, and Future, A Sociological Look, A Political Look, An Economic Look, A Spiritual Look. 64 pgs. 5 1/2 x 8 1/2. Paperback. ISBN: 0-89540-154-1. $3.50.